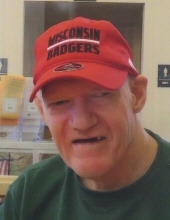 Scott Zuengler, Age 67, formerly of Adell, passed away in Marshfield on February 2, 2019. He was born on December 13, 1951, in Adell, WI, a son of the late Florence (Nee Neumann) and Martin “Brick” Zuengler. Scott was a baptized member of Adell Emmanuel Lutheran Church. As a youth, Scott enjoyed 4-H, playing piano and trombone, athletics and delivering newspapers. He was an accomplished Baseball player for his age. He loved his Milwaukee Braves and until recently could still recall the names and numbers of the Braves from the late 50’s. Scott developed schizophrenia in early adolescence which impacted his development, eventually requiring full-time residential care and treatment. He resided at Norwood Health Care Center in Marshfield the past 44 years, where he received wonderful love and care. Scott considered staff and residents at Norwood as “family” especially enjoying interacting with ladies. He had a wry sense of humor, enjoyed by all. Scott is survived by: Sisters: Kaye Zuengler of St. Paul, MN and Dawn Zuengler of Midland, MI; Brother: Richard (Milda) Zuengler of Adell, WI; Sister-in-law: Sara Zuengler of Campbellsport, WI; Niece: Lillian; Nephews: Joseph (Michelle), Matthew (Joelle), Benjamin, Robert, and William (Cari). He is also survived by 9 great nieces and nephews. He was preceded in death by: His parents; Sister: Cheryl Danninger; and Brother: Keith. Private family services will be held at the Suchon Funeral Home in Plymouth. Rev. Christopher Seifferlein, pastor of Emmanuel Lutheran Church will officiate. Cremation will take place and inurnment will be in the Emmanuel Lutheran Cemetery in Adell. A memorial fund is being established in Scott’s name for the Mental Health America of Wisconsin. To send flowers or a remembrance gift to the family of Scott Zuengler, please visit our Tribute Store. "Email Address" would like to share the life celebration of Scott Zuengler. Click on the "link" to go to share a favorite memory or leave a condolence message for the family.